While Sweden is considered to be a leader in gender equality today, there has been and still is an expectation, whether implicit or explicit, that men propose marriage. But skottdagen is different. Skottdag or skottår is leap year. Skott, in this case, means to add something into the mix. Like an extra day, for example. It’s one of those days where the world is turned upside down. Used to a year of 365 days? Tough, this one has 366! And when the world is turned upside down, it’s acceptable for women to propose. Since the late 1800s, there’s been a tradition in Sweden that suggests that women are allowed to propose marriage on leap-year day. That awkward term, leap-year day? That’s because leap-year day hasn’t always been February 29. 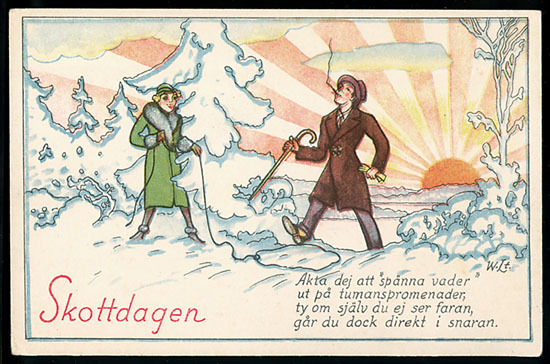 Turns out that before a bunch of different calendar reforms, Sweden recognized leap year on February 24 every year. In fact, February 29 as leap year in Sweden is relatively new. It wasn’t until the year 2000 that February 24 became just a normal day and February 29 was added to the calendar. But the tradition suggesting that women can propose marriage has been around longer than that. It probably made its way over from England, maybe Scotland, sometime during the 1850s. By the late 1800s and early 1900s, it had gained a little steam. Folks started joking about it. People sold postcards depicting men being chased by women with nets, women shooting Cupid’s arrows at the man they hoped to marry, and women, literally, about to bag themselves a man. Those postcards depicting age-old stereotypes, those jokes about women taking control probably further cemented the gender expectations. But along with joking about it, it seems that the tradition had at least some affect on the way women interacted with men. While there probably weren’t droves of women proposing to their partners in 1903, there probably were a decent chunk of women who felt a bit more emboldened to flirt, to show some interest, to, you know, admit that they had and could show interest and initiative with regards to men. That’s the fun thing with traditions, they pop up, they change, they adapt and adopt, and then they disappear. Sometimes those traditions are limited to certain groups of people, which seems to be the case with women proposing in Sweden during a leap year. That is, that tradition never really took off with anyone but the Swedish bourgeois. But whether it was a domestic servant on a farm in Skåne proposing or a young woman living at home in Stockholm with support from her family proposing, folks then, and now, knew what they were expected to do. Traditions are change, but they are there for a reason. They serve some purpose. What that purpose is probably depends on who you ask. This one, for example, could suggest gender expectations (for both men and women) were so rigid that a day on which women were "allowed" to propose could be adopted (and then adapted) giving some women just a hint of freedom. So leap year traditions become an interesting look at upended gender expectations. Of course women could propose 100 years ago. They just didn’t. At least not regularly. Societal expectations are strong and dominate how we act in the context of that society. Whether we want to openly admit that or not. So when a tradition that came along and said women could shed those societal expectations, even for just a day, people paid attention. Because think about it for just a minute. This tradition suggests that women are only allowed to propose once every four years. One day out of 1,461 days. So why does the tradition live on in a country that prides itself on being a bastion of gender equality? There are all kinds of arguments to be made. Maybe it’s just kind of a joke. People get a kick out of reliving those old traditions as if to say, look at our silly ancestors and look at how far we’ve come. Or maybe it’s more serious than that. Structural gender inequality, while less obvious in Sweden than in most places, suggests that there are still normative gender expectations, which can be subverted through tradition. Or maybe it's a way to hammer home gender stereotypes, by focusing on the one day when it is "acceptable" for a woman to propose. Or maybe people are just nervous about popping the question and need an excuse. Interestingly, according to Jonas Engman, a folklorist at the Nordic Museum, the day is also seen by many to be imbued with lots of luck—sometimes good, but usually bad. Take that for what it’s worth. Welcome to Sweden. And an extra day of work in 2016. Thank you so much for your blog! I have just sent my 30-yr old son to Sweden to work for several years. My great-grandmother was from Sweden, and I remember she and my grandmother conversing in Swedish when they would talk about something they didn't want us to know about. Matt (my son) mentioned today that "utfahrt" was the only word he had learned so far, and one of his Swedish friends mentioned the next one would be "slutstation," so I had to check it out. It looks like he's going to have a very similar experience to yours, so I'm glad I found you. Taks a meka! (I think that means thanks a lot.....it's one of the few phrases I remember)! Yes, it's me after a couple of windy years back in Finland! Found you again, by mistake while looking for my old blog posts. It seems that you are still on a right track with attitudes ;). I haven't blogged much since, I've had so much else to do. But if I start again, I'll let you know.